Apple bets on a legacy iPhone 8 design and retains the familiar home button placement, while the G6 intros a forward-looking 2:1 aspect ratio. Apple used the same “surfboard” design for the iPhone 8 that its adherents know and have been accustomed to for a few years now, but introduced a brand new glass back so that it can throw in wireless charging. It undoubtedly feels premium and solid in the hand, but will break easier than the predecessor's metal housing if you drop it. That's not a con against the G6, of course, as this one also sports an all-glass design that is not immune to shattering when it hits the pavement. Looking around the phones, we find different fingerprint scanner solutions, as Apple traditionally places its Touch ID sensor at the front, while LG has a combined lock/fingerprint key at the back. Which approach you prefer probably depends on whether your phone spends a lot of time flat on a desk or not, but LG's placement has one other benefit that might tip the scales in its favor. Yes, we are talking about screen-to-body ratio, as moving the home key and finger scanner duties at the back, shrinking the bezels all around, and implementing an unorthodox display proportions has allowed LG to stuff a largish 5.7” display in a body akin to a 5.2-incher, while the iPhone's top and bottom bezels encroach too much in comparison. But needless to say, the iPhone with its 4.7” screen is still the more ergonomic and manageable to hold and operate with one hand. Both displays cover the DCI-P3 “wide color” gamut, but the iPhone 8 exhibits more credible presentation and better outdoor visibility. Speaking of displays, they may diverge at size and resolution (5.7” 1440x2880 pixels for the G6 against 750 x 1334 pixels on the 4.7” iPhone 8 panel), but converge at their ability to represent rich color standards like the wider DCI-P3 gamut. This comes in handy when watching high dynamic range imagery, either from services like Netflix, or taken from the iPhone's own “wide color” camera. The G6 has the more pixels on the display, but the iPhone's resolution is perfectly adequate for the screen size, too. 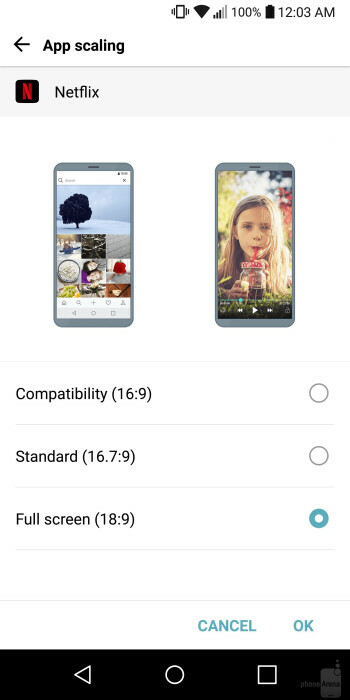 LG throws in options like always-on display that can show you time/date and notification info on a locked screen, but is somewhat of a battery hog on a handset that doesn't flaunt a very good battery life to begin with. Our own display tests returned very good brightness and contrast ratio on both phones, with an advantage for the iPhone 8 in outdoor visibility. When it comes to color presentation, though, Apple's factory calibration wins decisively. The G6 exhibits rather cold colors in comparison. The iPhone 8, on the other hand, sports Apple's True Tone display tech, employing sensors that measure the ambient light color and brightness. The handset then uses this information to adjust its display on the fly. It can basically correct white point and illumination based on your environment lighting in order to render the right kinds of white under any light source, and it really shows when the iPhone 8 is sitting next to the G6 and its cold, blueish screen. 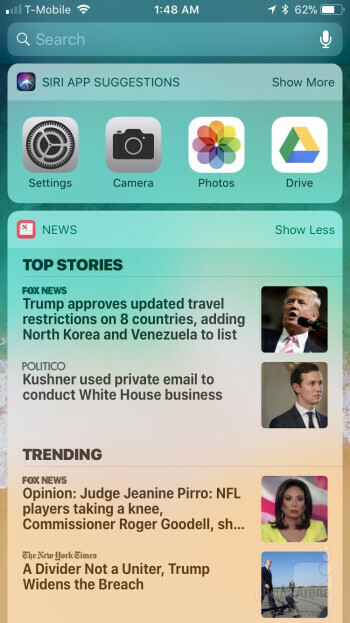 The iOS 11 interface on the iPhone 8, and the LG UI over Android 7 on the G6 are rather different to merit a direct comparison, as you can imagine. 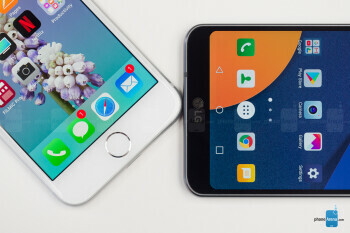 Still, there is a growing trend among major Android makers to dispense with the app drawer, like their Chinese counterparts have been doing for years, and as iOS was conceived to begin with. 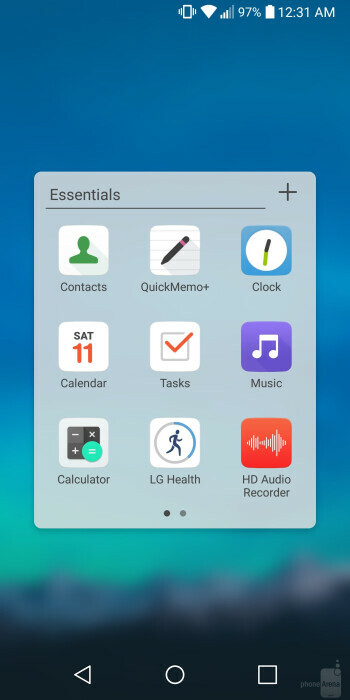 The LG UI still allows you to have the classic app drawer as an option, unlike the iPhone 8, which offers folders to group up your apps, and homescreens upon homescreens to nestle them. 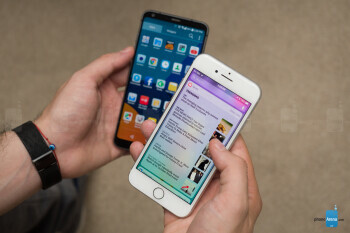 Both handsets offer a widget system for your homescreens, too, though the iPhone limits it to a dedicated page. 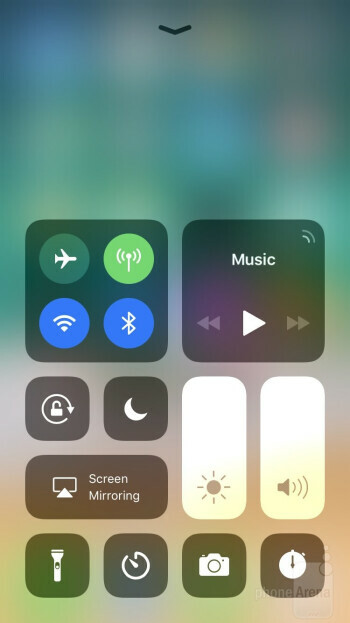 One of its biggest new features of iOS 11 is the redesigned Control Center that not only crams more functionality, but also gives users the ability to customize what toggles they see. That's a feature that Android overlays have had for a while, though, and Android 7 Nougat on the G6 is no exception. LG's status bar looks more cluttered in comparison, and with much less visual polish than the new iOS Control Center. 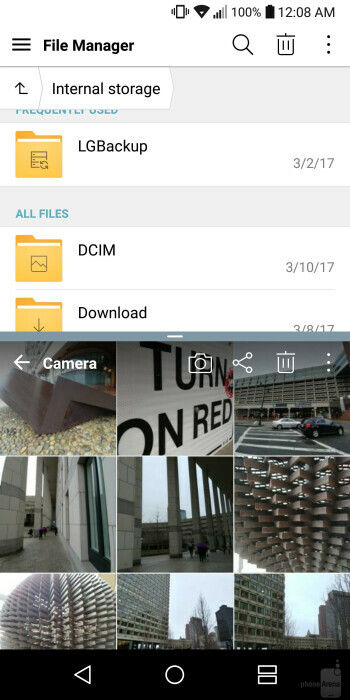 The other new feature that has been in Android overlays for a while, and has now landed on iOS 11 is a file browser. LG explicitly touts the split-screen multitasking that is present on the G6 not because it is something new, or because iPhones don't have it, but rather since the new 18:9 aspect ratio of the display is better suited for the purpose than a traditional, 16:9 one, which is a small enhancement if you use that feature. In theory, the taller, narrower aspect ratio of the G6 display is better suited for fitting more content, though whether that's the case would depend on the use case and the app you're in. When it comes to video scaling, most footage is not shot with the G6 aspect ratio, so clips get cropped, black-barred, or stretched out of proportion to fit 2:1 in the LG-provided compatibility mode. 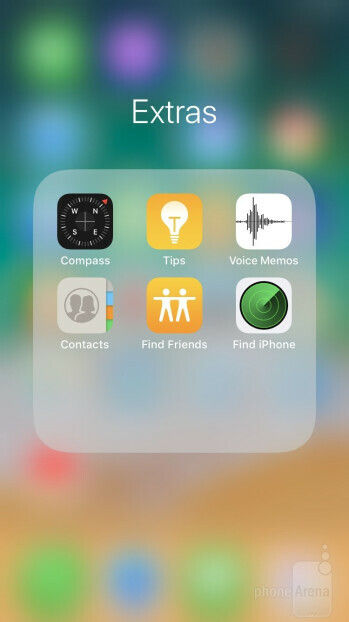 Overall, iOS 11 is the more polished and uniform interface, offering you access to globally popular services like Apple Music, iMessage, Health, or Apple Pay, while the App Store brings you a more coherent and visually appealing app ecosystem. 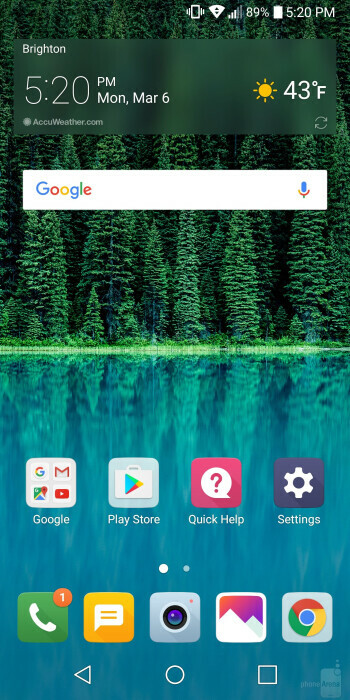 The G6, on the other hand, offers way more customization, down to theming or rearranging the navigational keys, making it the better choice for folks who like options and choices, and are fond of tinkering, rather than the “just works” approach of Apple. Last year's Snapdragon in the G6 gets smoked by Apple's new Bionic chipset. 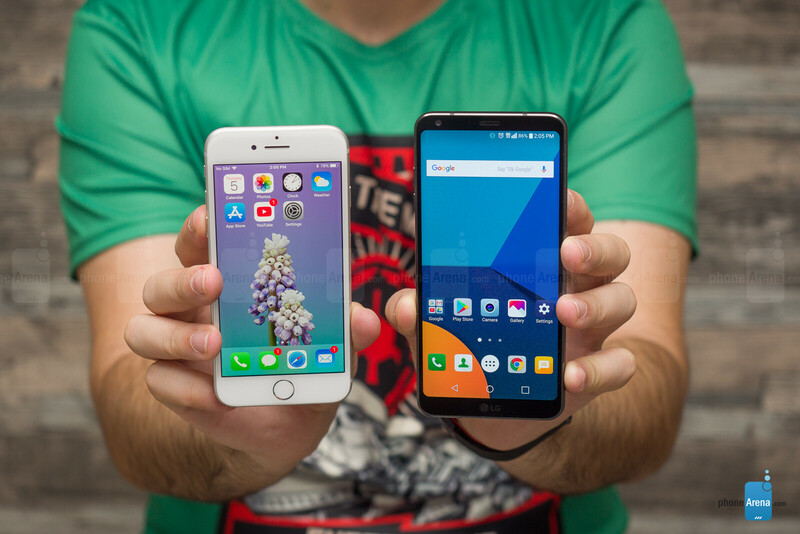 The G6 runs on the 2016-finest Snapdragon 821, which, while not a weak chipset, is made with an older production node than the Bionic processor of the iPhone 8, thus scores times worse in benchmarks. In everyday usage you won't notice the G6 to be underpowered, except in very heavy games or AR shenanigans, but the 14nm chipset definitely takes a heavier toll on the battery than the 10nm silicon in the iPhone 8. 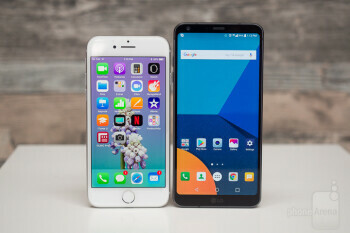 The same goes for the random access memory – while the G6 boasts 4 GB RAM, double the iPhone 8 amount, Apple's synergy of chips and software makes for at least as fluid experience nonetheless. The iPhone 8 also ships with 64 GB of basic storage out of the box, which we can only commend in this media-heavy day and age, while the US carriers' G6 comes with 32 GB, yet it does offer a microSD slot for expansion. The iPhone 8 camera outshines the G6 in video recording, dynamic range, and color fidelity, while LG counters with a dual camera and plenty of manual modes to tinker with. While keeping the 12 MP resolution, Apple has upgraded the iPhone 8 camera with an improved sensor that is able to soak more photons coming in. The G6 rises up against it with a 13 MP main camera sensor that has smaller, 1.1 vs 1.2 micron pixels, but adds another 13 MP sidekick with a wide-angle lens. There is a 7 MP selfie cam on the iPhone, while the G6 has a 5 MP shooter, also with an f/2.2 aperture but a lens of much wider angle. The camera apps throw in the kitchen sink of features and effects, although only the G6 gives you full manual controls for photos and video recording. Apple's new dedicated image signal processor makes for a very speedy camera that always shoots in auto HDR mode, there is not even a toggle for HDR in the app, as the software goes for it on its own. The G6 is slower to take and record a shot, yet not to the extent that the average user will notice a grand difference. Getting down to brass tacks, the LG G6 pulled a solid performance in daylight, albeit with color presentation that is very often oversaturated compared to what's in front of the lens. The iPhone 8 produces true-to-scene colors that might seem a tad lifeless in comparison, yet it manages to capture every slight nuance, which, coupled with the excellent dynamic range and lower amounts of noise make it a formidable opponent for the G6. The front camera of the iPhone 8 snaps selfies with warmer colors than the more credible hues from the G6, but produces a tad sharper photos with more detail. Shooting with the second wide-angle cam on the G6 intros noticeable scene distortion, though it does fit more in the frame. Here we have to again mention that both phones shoot in auto HDR, and on the cloudy day we had the HDR shots were prevalent, which may explain the good dynamic range on all of the resulting pictures. The G6 takes way more time to save the shot when the tiny “HDR” prompt is present in the top right corner of the app interface, though. Indoors and in lower light scenarios, the iPhone uses a step higher exposure than the G6, resulting in slightly burned highlights, but way more visible scene. When it comes to color presentation, the daylight results are reversed – here the iPhone produces warmer, more pleasant to look at color, while the G6 gamut looks colder and more bland in comparison. 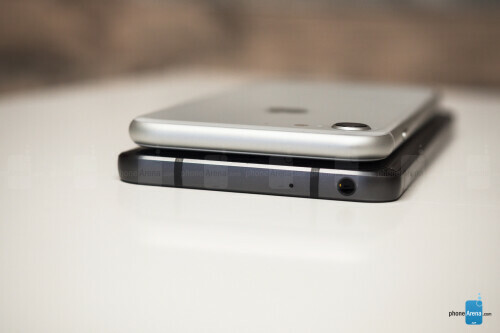 The amount of digital noise is kept well in check on both phones. 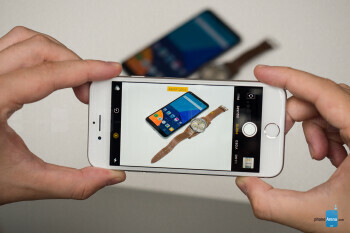 Where the iPhone shines above the fray is video recording, as usual, since this year the new Bionic chipset and custom Apple-designed ISP allow for recording high-def 4K video with the smooth 60fps, and 1080p slow-mo with 240fps. 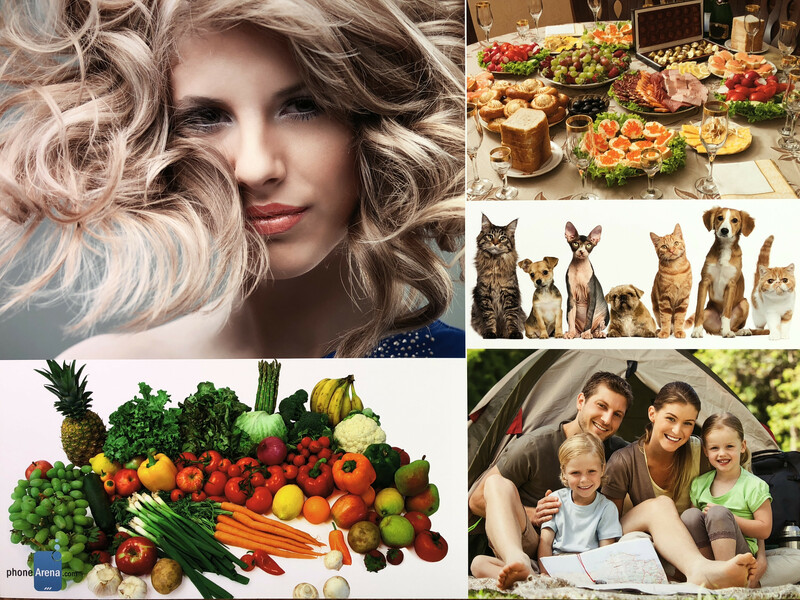 No matter how you're shooting, the camera easily handles varying lighting conditions and seamlessly reacquires focus and adjusts exposure as needed. The mono audio recording leaves a bit to be desired compared to the stereo quality of the G6, but the iPhone 8 does offer good noise-cancellation that weeds out ambient fluff when you start to speak behind the camera. The 60fps footage is out of this world, yet a minute of it will cost you about 400MB in storage, so be advised. Video shot with the G6 looks very good, too, albeit a bit oversaturated, and the phone did an admirable job at managing exposures, refocusing on new subjects, and capturing intelligible audio even when fighting against some serious wind. One big plus is the ability to toggle between zoom and wide cameras while you're right in the middle of filming, and while there can be a very brief period where the camera has to recompute its exposure levels, it's still impressively seamless. We also really enjoyed the video stabilization mode, helping to remove a bit of the “this was clearly shot on a handheld device” jitters. We already mentioned that the two displays will let you enjoy HDR and Dolby Vision movies with wider color and dynamic range than their basic subscription counterparts. 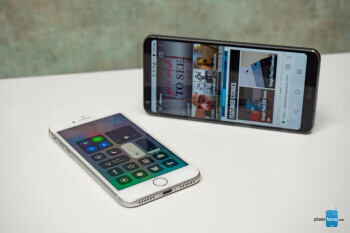 The 2:1 aspect ratio of the G6, however, means that by default the screen area visible when displaying most shows will be only about 15% larger than that on the iPhone 8, unless you are watching in the stretched-out compatibility mode. 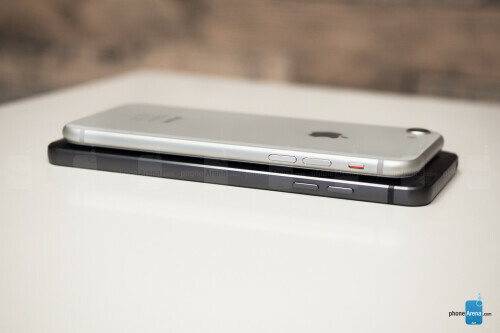 While still bigger, that's far less than what users would imagine when they hear a 4.7” vs 5.7” display battle. 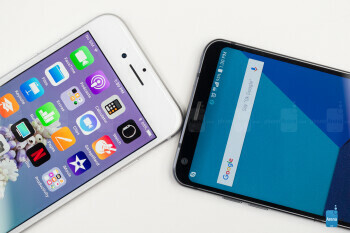 When it comes to sound, the iPhone flaunts stronger headphone and stereo speakers output than what the G6's single speaker is capable of. LG counters with extended focus on audio like 32-bit sound in some markets, but, sadly, not on the US model. 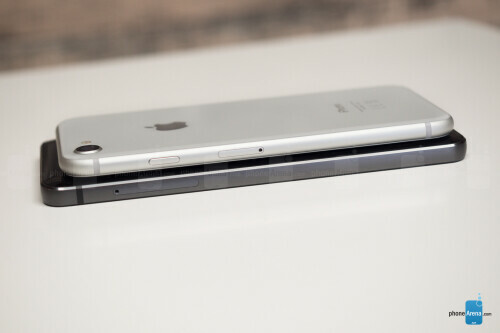 Still, a built-in 3.5mm jack is present for those who demand it. 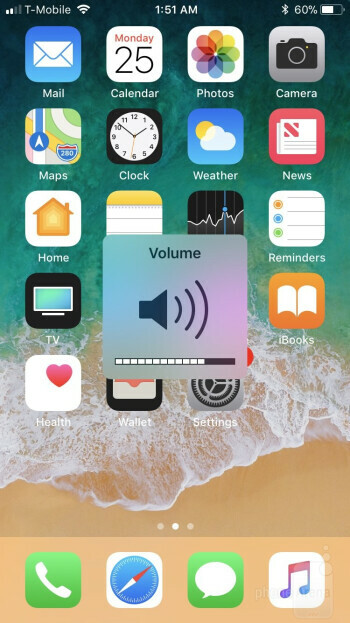 We tested the iPhone 8 for call quality against the G6 paying particular attention for any static noise or beepy sounds that some units are said to be laden with, which Apple mentioned will be fixed with a software update. There were no issues, though, and the voices came loud and clear through the earpiece without unusual artifacts. The timbres were easily recognizable, but the G6 mics brought a bit of hollow sound with slight distortion. On the other end the iPhone relayed our voice with nary any amount of ambient noise getting through, but the earpiece on the G6 sounded a bit muffled and less intense than the iPhone 8's top speaker. Much longer battery life on the iPhone 8, but fast charging will cost you extra. Thanks to the more frugal 10nm chipset and other software and hardware optimizations, the iPhone 8 lasted an hour more on a charge than its predecessor on our battery benchmark test, despite having a smaller, 1821 mAh battery. 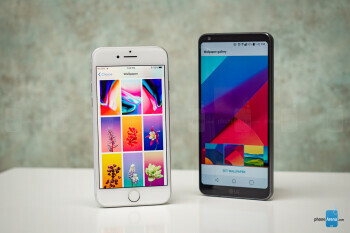 LG's power-hungry Quad HD+ screen and the aging 14nm processor eked out just 6 hours of screen-on time out of the 3300 mAh pack at the same test, a much shorter endurance than the iPhone. When it comes to charging speeds, the roles are reversed – the G6 charges for hour and a half, while the iPhone 8 needs more than two hours with the stock charger. With Apple's souped-up 29W adapter, you'd be able to top up quicker, as the phone certainly supports fast charging, but that will cost you $49. Alternatively, Apple lists that any third-party USB-C power adapters that supports USB Power Delivery (USB-PD) will work with the respective Lightning adapter to top up your iPhone 50% in 30 minutes, too. Both handsets have wireless charging built in, but you'd have to wait a bit to get Apple's fancy multi- device pad, and can soothe your pains with approved third-party chargers from Belkin or Mophie in the meantime. 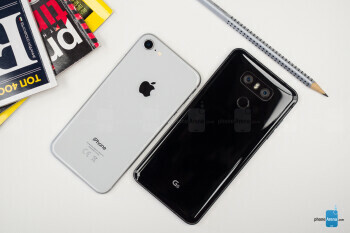 When all is said and done, the iPhone 8 betters the G6 in a few key areas like camera quality, battery life, basic storage, processing speed and LTE network compatibility. 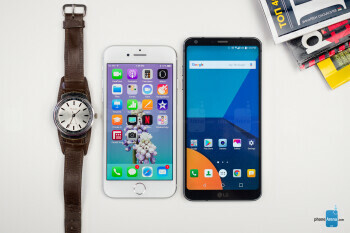 And it should, since it is the more expensive one, starting at $699, against the LG G6 that hovers around the $500 mark at the moment, not to mention some BOGO offers or other enticements over at US carrier shops. What LG's spring flagship has going for it is the dual camera and that high-res Dolby Vision display with the 2:1 aspect ratio, which, however, is marred by some calibration issues, and not nearly as pleasant to watch regular aspect videos on, as its size and HDR stickers would suggest. When we add the better call and speaker quality, the coherent app ecosystem, as well as the higher resale value of the iPhone, in the end you get what you pay for with both handsets.